I went to Mumbai, Pune this week after some gap of 3-4 years. Mumbai never fails to surprise me. It brings up something new every time. Just could not figure out how this maximum city survives when a tourist like me bewilders abt the traffic jam on the Bandra flyover. 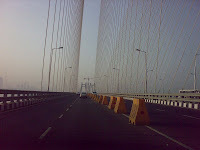 I drove through Worli Sea Link and felt bit excited. As usual, had bites of street food like vada pav, pani puri and one dish called "bell" - chinese chat item. All were good. 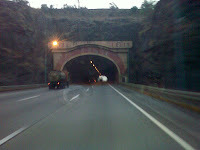 Drove down to Pune through Mumbai - Pune Expressway (done by IRB) in the foggy morning and liked it thoroughly. But the heavy vehicles end up struggling bcoz of hill terrain, curves. 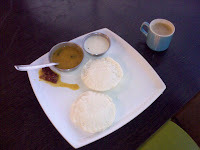 There was a food mall on the way and they were calling "Thoosai" for dosa and "Soombar" for Sambar... had a hearty laugh abt it.